I became tired of looking at my dry, pale skin. I was neglecting to put on lotion and there was no way I could lay out for a nice tan. It was chilly plus I did not want my skin to be damaged by the sun. My first experience this year with self tanner was spray tan. It turned out horribly so I vowed to never try it again. So, I was looking around in Target for some good self tanner lotion. Everything was more expensive than I thought. A lot of lotions were from six to ten dollars for a few ounces of lotion that did not even provide moisture for dry skin. 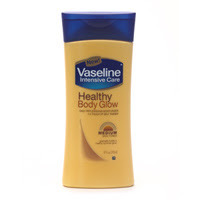 I have had good experiences with Vaseline products so I decided to give the Healthy Body Glow lotion a try. It was around three dollars at Target, but online it runs for around six. I suggest you try Target or Walmart before looking online. The lotion was creamy, but not too thick. You had to use a lot when applying it. I used it on my whole body so I would be tan all over. The scent was not the best and It took a little getting used to. After the first application I was a shade darker. Gradually I became more and more tan. It looked a little orange at first, but after a few days it became more natural. This lotion also made my skin feel very smooth. My skin was no longer dry and it felt much better than before. Vaseline Healthy Body Glow lotion does the trick for me and I feel great when I go out! I saw this and tried looking for it in the stores and it wasn't there! It either is really popular or just not out where I live. Well it sounds like a great product!